Composite Hoses are manufactured on the mandrel wrapped principle and consist of an inner wire spiral upon which layers of fabric and film are wrapped and wound with an external wire spiral. The tension between each wire spiral gives the hose its pressure capability. A hose’s end application determines what materials will be used in its assembly. These can include: Polypropylene, Polyester and Polyamide. The wire helixes can be of galvanised steel, aluminium, stainless steel, or polypropylene-coated steel. 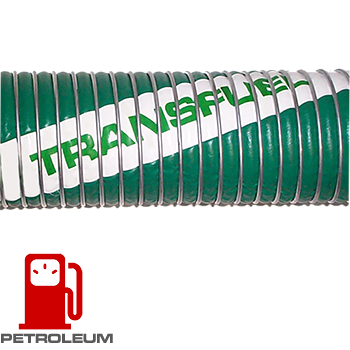 Transfuel is a suction and discharge hose mainly for the transfer of petroleum products by road, rail tankers and loading gantries. It is not advisable to use this hose with aviation fuels due to possible contamination from zinc flakes. Composite hose made from polypropylene fabrics and films with an abrasion resistant PVC coated fabric cover, reinforced with internal and external wire helixes. The hose contains a barrier layer for 100% aromatic hydrocarbons. 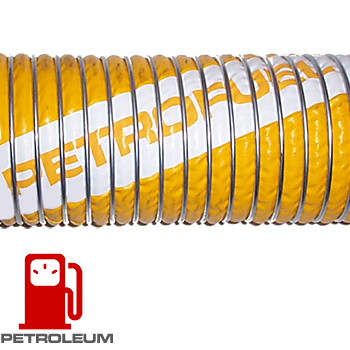 Petrofuel Light is a light weight suction discharge hose mainly for the transfer of petroleum products by road and rail tankers, for applications where the weight of the hose is an issue. The aluminium inner wire provides the lighter weight. The crush resistance of the hose is not as good as with a hose with steel/steel wire. 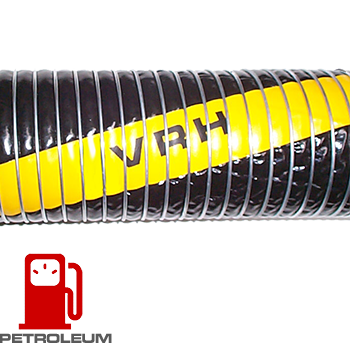 VRH is suitable for the transfer of hydrocarbon vapours and is used generally within the petroleum industry for their vapour recovery systems. 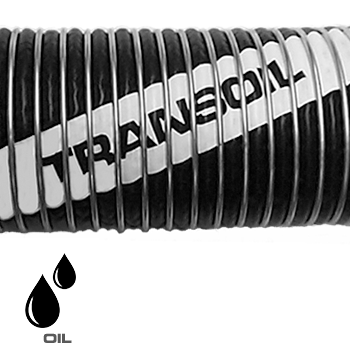 Transoil is especially suitable for the suction and discharge transfer of petroleum products in in-plant and light duty dockside applications. 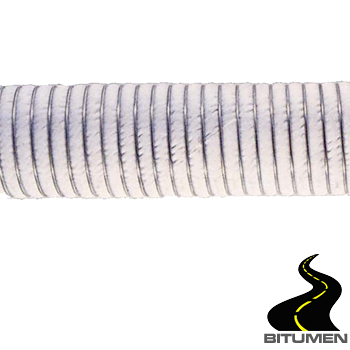 It is an excellent hose for conveying tallow and high aromatic hydrocarbons. 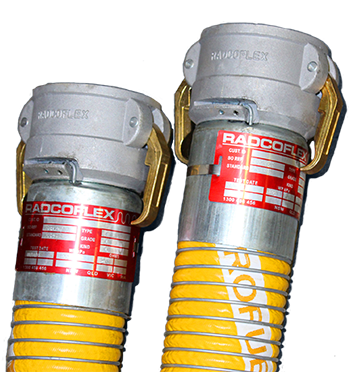 The hose can be covered with rope lagging for external protection if required. 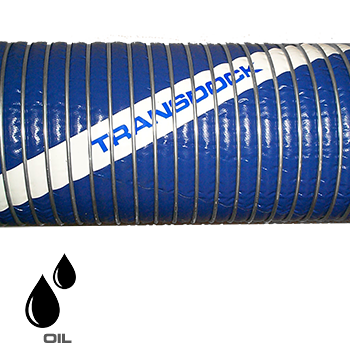 Transdock is suitable for the heavy duty suction and discharge transfer of petroleum products in road and rail tanker, dockside and ship to shore applications. Transdock-S has the added suitability for applications involving corrosive atmospheres and splash. Composite hose made from heavy duty polypropylene fabrics and films with a double layer of abrasion resistant PVC coated fabric cover, reinforced with internal and external wire helixes. 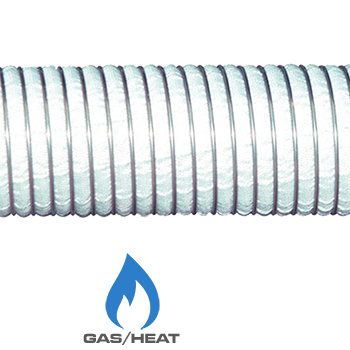 The hose contains a barrier layer for 100% aromatic hydrocarbons. 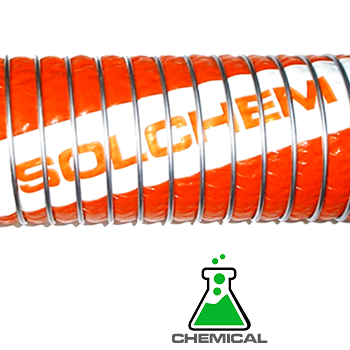 Principal Applications Solchem is suitable for the transfer of various acids and alkalines where the conveyant may be corrosive to the galvanised inner wire. Solchem-S has the added suitability for applications involving corrosive atmospheres and splash. Composite hose made from polypropylene fabrics and films with an abrasion resistant PVC coated fabric cover, reinforced with internal and external wire helixes. Transchem is suitable for the transfer of acids and alkalines. Transchem-S has the added suitability for applications involving corrosive atmospheres and splash. Solflon is suitable for the transfer of the most aggressive chemicals and searching solvents. The PTFE liner has a low co-efficient of friction making the hose also suitable for the conveyance of high viscosity products such as paint. Solflon-S has the added suitability for applications involving corrosive atmospheres and splash. Composite hose made from polypropylene fabrics and films with an abrasion resistant PVC coated fabric cover, reinforced with internal and external wire helixes. The hose is lined with layers of PTFE film. 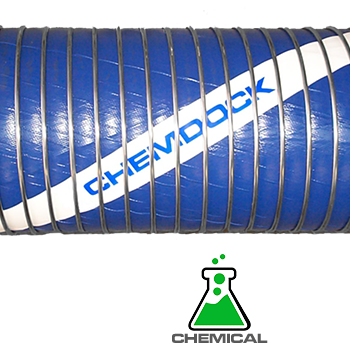 Chemdock is suitable for heavy duty suction and discharge of bulk chemicals in road and rail tanker, dockside and ship to shore applications. 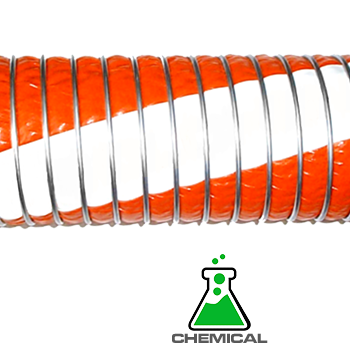 The addition of the PTFE liner in Chemdock-E makes it suitable for the most aggressive chemicals and searching solvents. Composite hose made from heavy duty polypropylene fabrics and films with a double layer of abrasion resistant PVC coated fabric cover, reinforced with internal and external wire helixes. The standard manufacture is with SS316 inner and outer wires - see Datasheet for other options. Bituflex is suitable for the transfer of bitumen and tar at elevated temperatures, primarily for wand/hand bar applications. Composite hose made from polyester fabrics and films with an aromatic barrier layer, reinforced with internal and external wire helixes. Cryogas is suitable for conveying a wide range of low temperature refrigerated conveyants including Liquified Natural Gas (LNG), Liquid Nitrogen and Liquid Ethylene. To transport gases, it is standard practice to liquefy them either by refrigeration to low temperatures or by pressurisation. 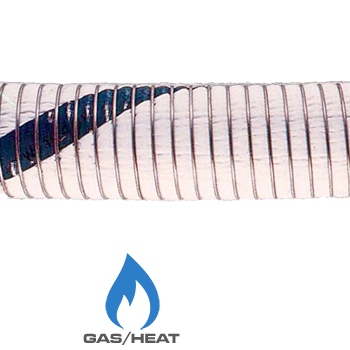 Composite hose made from polyester fabrics and films, reinforced with internal and external wire helixes. The fabric and films used in Cryogas have been selected due to their excellent resistance to low temperatures and their retention of flexibility. To transport LPGs, it is standard practice to liquefy them either by refrigeration down to -50C, or by pressurisation at approximately 20 Bar pressure at ambient temperature. Composite hose made from polyester and polyamide fabrics and films, reinforced with internal and external wire helixes. 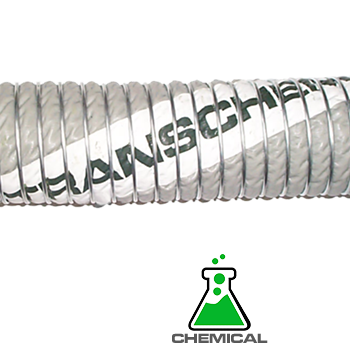 Transheat is suitable for the transfer of most hot fluids at elevated temperatures. 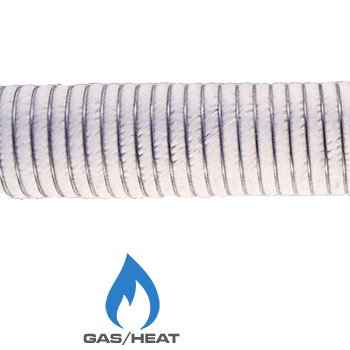 Composite hose made from polyester fabrics and films with an aromatic barrier layer and an outer cover of fibreglass, reinforced with internal and external wire helixes. The outer cover of fibreglass provides an additional insulation layer enhancing operational safety.